But, as you might suspect, I wasn’t always like this - barreling through castles and swamps I know better than my hometown, steamrolling bosses that once vexed me for hours. Up until a little more than a year ago, I hadn’t so much as glanced at one of these games. Not because I didn’t have the opportunity – after all, critics have raved about the series for the better part of a decade now – but because I was afraid of them. Terrified, in fact. I thought they were exactly the kind of game I avoid the most. When you suffer from any kind of disorder, you grow to hate labels. They become your shield and your burden; both a ready excuse and a constant reminder to yourself and others that there’s something not quite right about you. For me, it was the constant shuffle that did it – ADD became major depressive disorder, which beget cyclothymia, which beget generalized anxiety disorder, which beget an aversion to mental health professionals that still continues to this day. Whatever you want to call it, the takeaway is this: I, like so many other people, have suffered from severe anxiety for as long as I can remember. And while the brunt of it falls on other aspects of my life, it colors my approach to gaming more than most would think. Some of it was relatively mild. As an early teen, I wouldn’t play multiplayer games with my friends - the supposed “thrill” of competition would make my stomach do backflips. I devoured every first-person shooter game I could find, but never as the developers intended, for I would cheat to defuse the tension. As I grew closer to adulthood, these quirks ebbed away, but one remained steady: I treated difficult games as if they were coated in arsenic. While others scaled the brutal walls of titles like Shin Megami Tensei 3: Nocturne and Devil May Cry 3, I merely watched from the sidelines, knowing that their strict challenge would induce the same panic attacks I suffered during exams all throughout my academic life. It took my best friend to finally force my hand. After he took the plunge, Dark Souls was all he talked about for weeks and weeks, finally culminating in him driving me to the store and forcing me to buy it. Skeptical, but trusting his opinion, I finally dove in myself. Even the most ardent superfans will admit that the first few hours of Dark Souls are particularly punishing, even by Miyazaki’s standards. A hulking reptilian boss called the Asylum Demon famously serves as the game’s tutorial, easily flattening all but the hardiest players for their first few tries. Then the game spits you out in a hub world that spirals out into three distinct routes, only one of which is remotely feasible for a beginning player. Past mobs of undead, yet another massive demon lurks one of the game’s most irritating bosses – a duo of gargoyles who take turns barbecuing the player until they’re nothing but cinder and ash. Deep into this world I fell, mounting a slow and halting campaign against its obstacles. And a funny thing happened: yes, I died frequently, I cursed at the game incessantly, and I threatened to quit, but I never felt anxious, or panicked, or even uneasy. Actually, I felt better. Something about this faded, harrowed land actually calmed me down. Despite its apparent viciousness, Miyazaki’s design has elements that some may find soothing, especially compared to other games. Yes, you lose your experience, or “souls”, every time you die; but your inventory persists, and once you have an item, it’s yours forever. “Missable” items – objects that one can forever lose the opportunity to obtain (the bane of most role-playing games) – are nowhere to be found, and essentially every resource you need can be found or grinded out with enough patience. 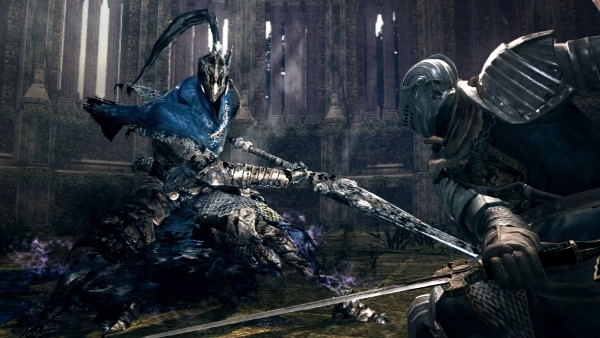 From Software’s games may shock and surprise, but they refuse to kick you when you’re down. There are rules here, and the game mostly sticks to them, except when it can sense your complacency. Then it might throw another rolling boulder at your face. Perhaps it’s Lordran itself that does it, the towers of the half-crumbled Anor Londo standing proudly against the passing of the age, desperately clinging to the last remaining vestige of its magnificence. Make no mistake, the world of Dark Souls isn’t dying; it’s dead, and you’re there to pick up the pieces. Its ruins teem with fallen gods, wild demons, and madmen once called heroes, all trapped in the same cycle of death and rebirth that only your player character can free them from. The few sane survivors that inhabit the swamps and caves and lakes treat the fact of their own existence with a heavy sigh, exhorting the player character to “not go Hollow” – that is, to stay sane with them, at least until it’s over. In a world so beautifully ruined, so submerged in “eternal twilight,” death ceases to be a fail state – it merely delays the natural order of things. And there’s something very calming about that. 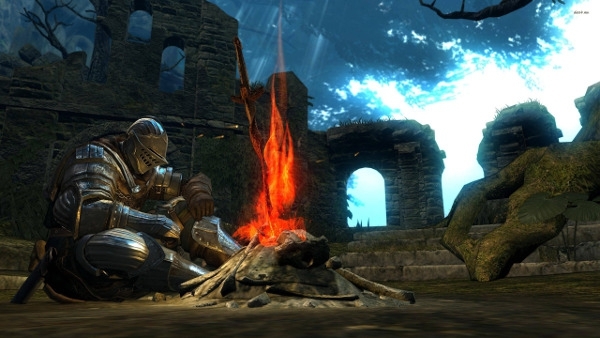 But most of all, it all comes back to the bonfire – the warm core of Dark Souls. The bonfire is everything – your bed, your HQ, your inn and your smithy all rolled into one, a place of small joy in a desolate world. The bonfires of Lordran offer me something I’ve always coveted but never quite captured, not in games and certainly not in life: stability. And that’s why I’ll boot up the game every now and then and just sit at one of them, watching my character bask in the twilight, ready to go forth once more. When he feels anxious, he has good reason to – there are demons on his tail; he has a world to save. So I let him rest; wishing, of course, that I could say the same.